Making your guided reading sessions useful and helpful for future planning and for the assessment of your students can get tricky! Especially when you have 30 children you need to listen to every week and you haven’t yet found a printable guided reading template or plan that actually works for you! Whilst the rest of your class is fully engaged (what a dream) in another small group English activity, you are then required to listen, plan and set goals for each of the students you are listening to while they read. You scribble a few things on a sticky note and then… the bell goes, a student needs you urgently because they feel sick and another is crying because they can’t find their hat. Suddenly, you realise you are meant to be on playground duty and are running late, you grab your hat and race out the door. Now, where did you put that sticky note with those very important points?? That’s where our Guided Reading Folder templates come in handy! Yes, it will take a little bit of your time setting it all up, but I promise you won’t regret it! This video will give you an idea of how to set a guided reading folder, although the options are endless with all of the customisable templates. Sometimes having a pretty looking folder just makes everything better! 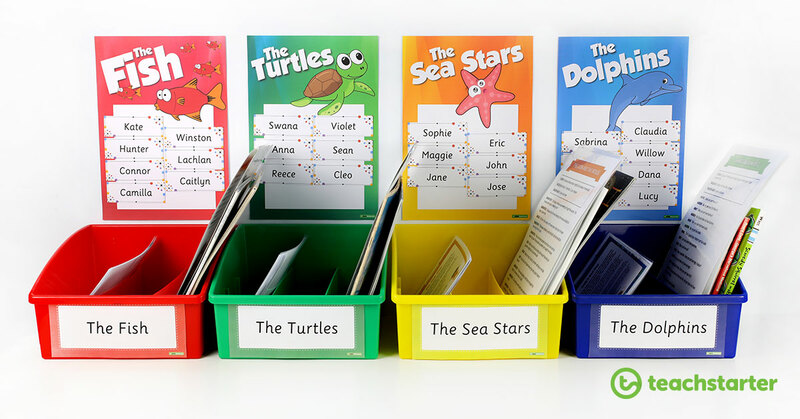 Our gorgeous Guided Reading folder cover and dividers with tabs are the perfect way to help organise your guided reading folder. Our beautifully designed dividers are available in Microsoft Word so that you can customise each tab to say what you want! Sometimes, you just need a little cheat sheet to help out, coming up with the perfect comprehension questions or prompts can sometimes get tricky! 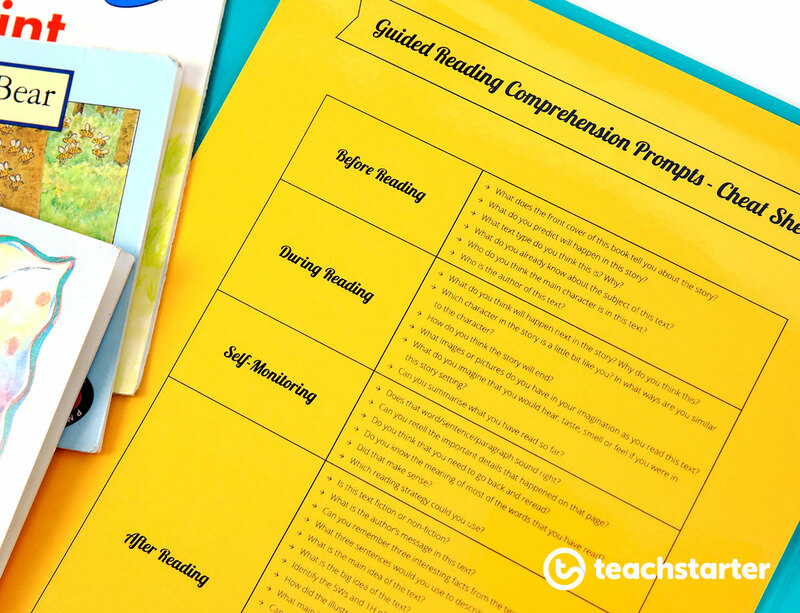 This Guided Reading Comprehension Prompts – Cheat Sheet is perfect to laminate and have handy during a guided reading session. 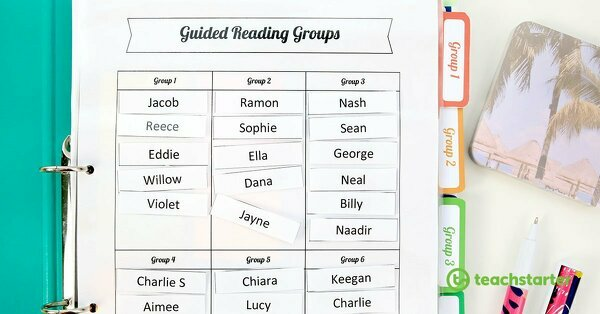 You may like to display your reading groups by using our Grouping Posters templates. 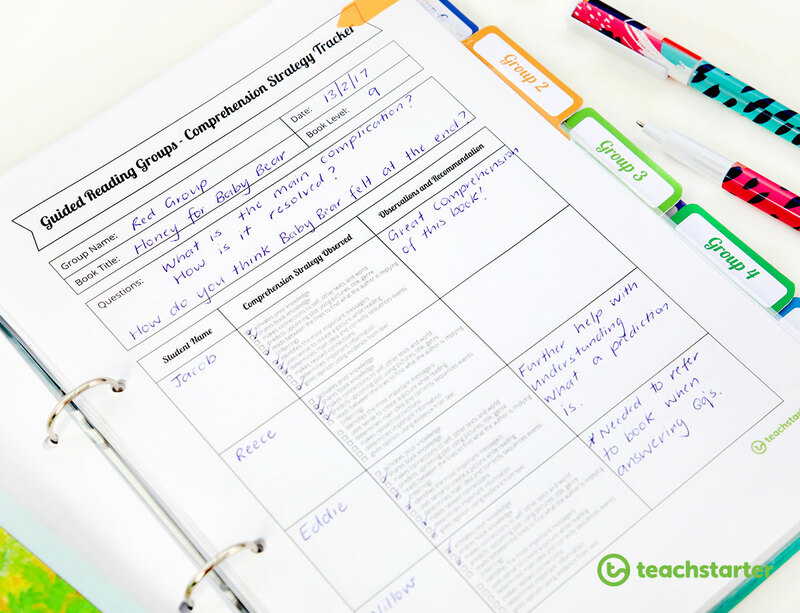 But, having something like this Guided Reading Groups – Organiser Template handy, while in the midst of a reading session with your students, is the perfect way to move students to different groups as you monitor and review their reading abilities! Type your students’ names on the name cards. Print, cut and laminate the name cards and the reading groups poster. 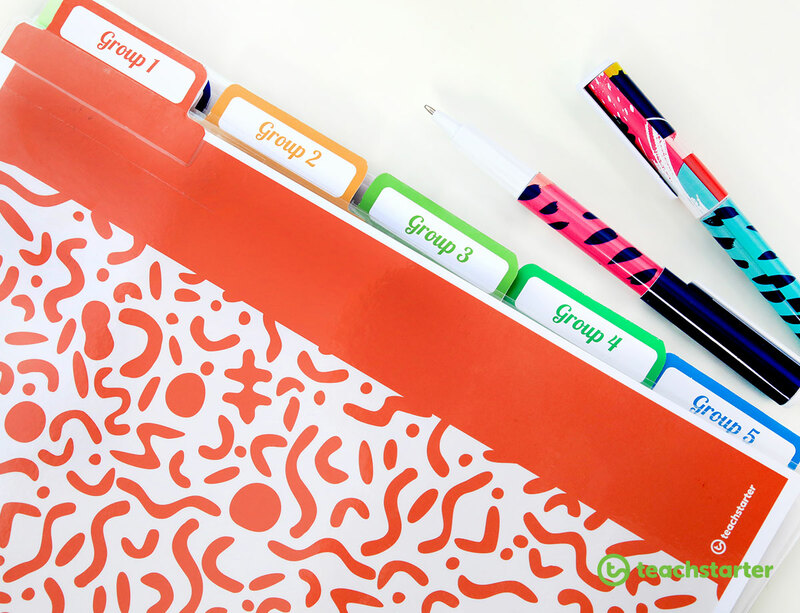 Attach the name cards to the table with velcro dots to make it easier to move the names around! 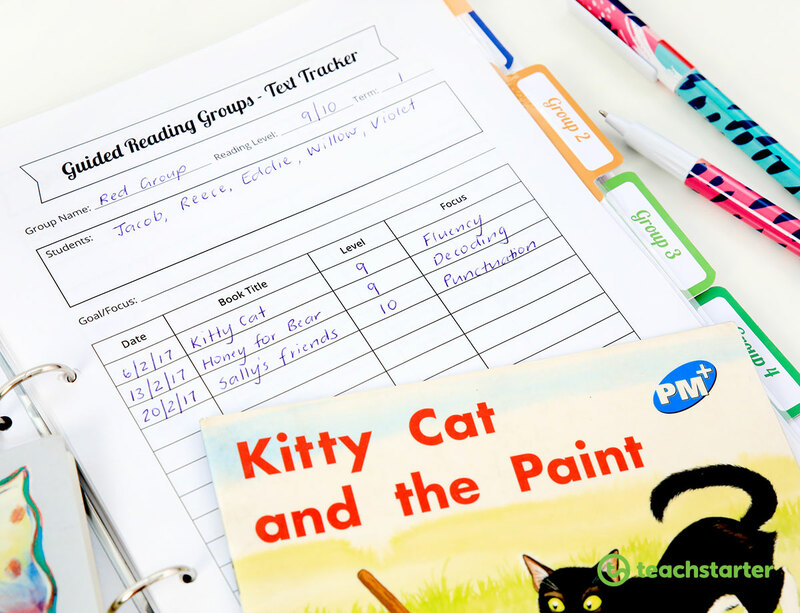 Use this guided reading template to keep note of the texts that each group have read and the focus for each guided reading session. Such a simple idea, that will make choosing each week’s text just that little bit easier! Monitoring the progress of your students reading is the most important aspect of this folder. 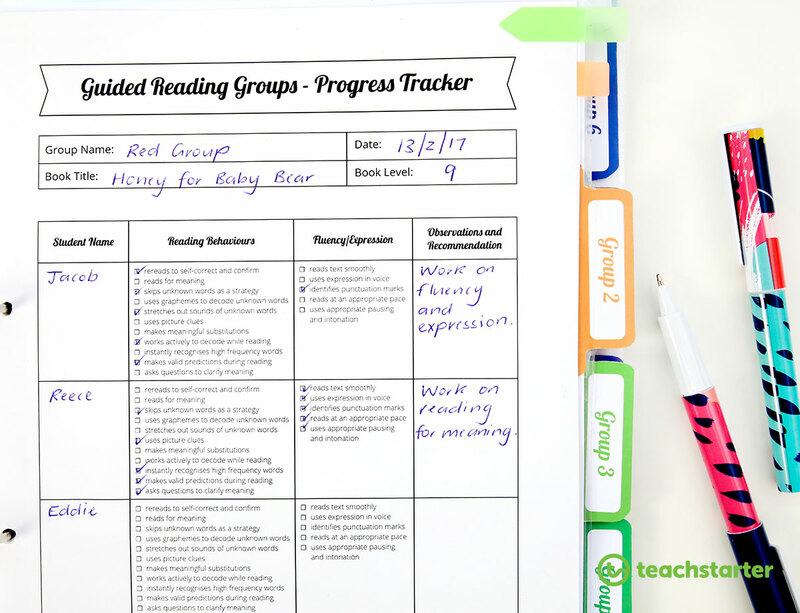 This Guided Reading Groups – Progress Tracker template is an easy way to observe and record each individual student’s reading behaviours, fluency and expression and decide upon a recommendation or goal for each student. The best part? 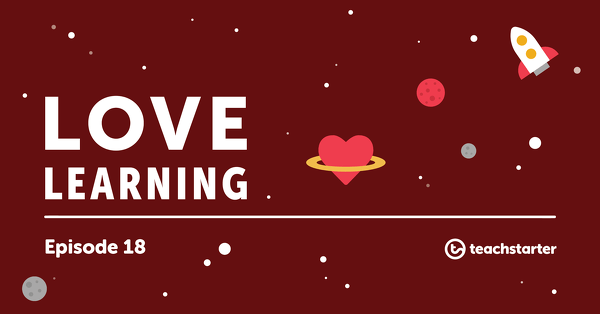 It won’t get lost in your beautiful guided reading folder! Comprehension strategies and abilities are just as important to monitor during a guided reading session. This printable guided reading template is fantastic to help keep track of the different comprehensions strategies observed. Fluency is important to bridge the gap between word recognition and comprehension. If a student isn’t reading fluently, it’s hard for them to understand what they are reading. 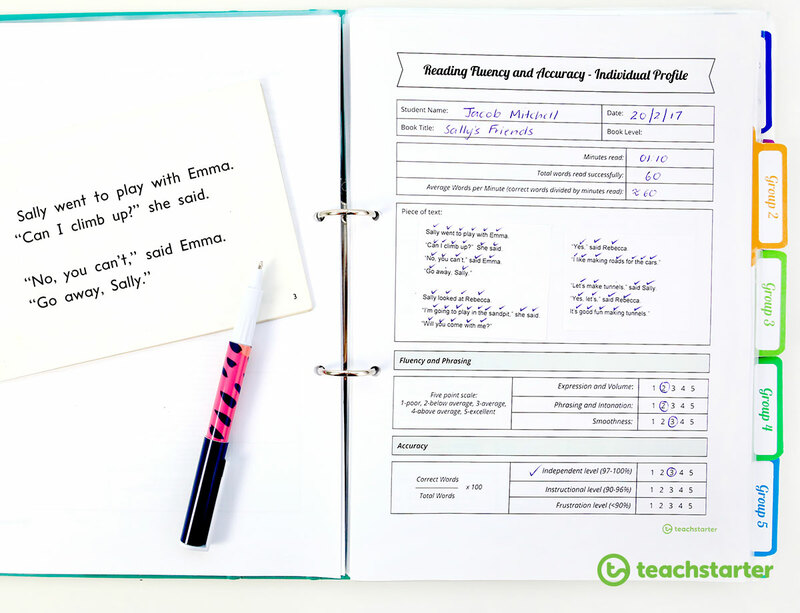 If you are wanting to track and assess an individual student’s fluency and accuracy during guided reading, use our printable Fluency and Accuracy Tool. Check out the whole Guided Reading Folder Resource Pack. Still Unsure About How to Do Guided Reading? 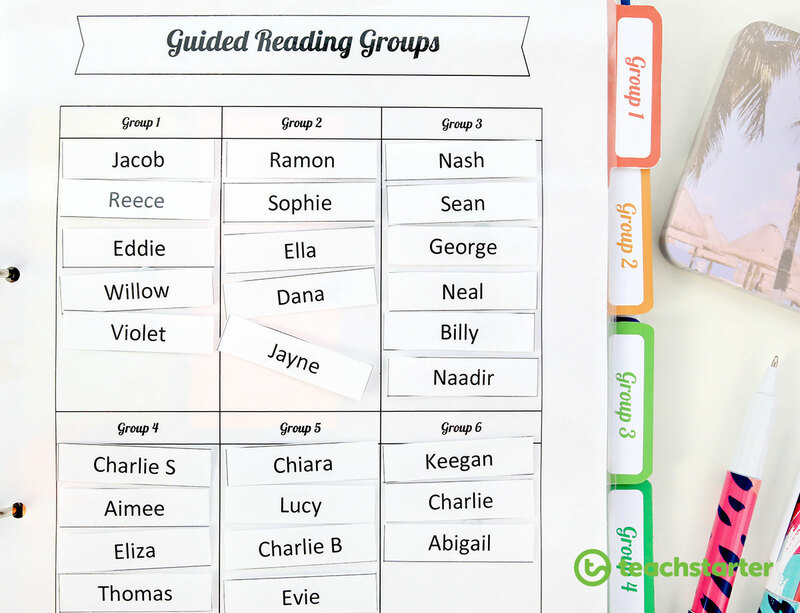 If you want to know how to manage the other groups while you are using this amazing teaching resource during your guided reading sessions, you need to check out our blog post about How to Set Up Guided Reading in the Classroom. We’d love to hear from you… Tell us your guided reading hints and tips for the classroom in the comments of this blog! What kind of guided reading templates do you find useful? What plan do you have to join to download all the placement templates? Please feel free to view our plans and what is included by following this link – www.teachstarter.com/plans. I hope this helps. If not, feel free to email [email protected] and our customer support team would be more than happy to help. We have great news! 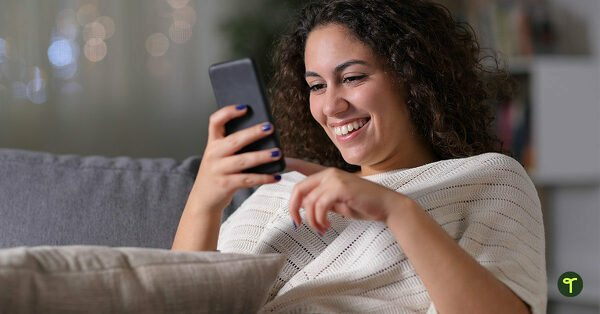 You can now save blogs for later. Simply look for the flag looking icon beside the heart above the main image of this blog. By clicking on the ‘save for later’ you will be saving the blog in your gallery! I hope this is helpful. Thanks soooo much Teach Starter for these resources. Your site continues to amaze me with the scope and quality of your resources. Amazing. I recommend to you to all teachers I know. Thanks so much for your lovely feedback Kym! 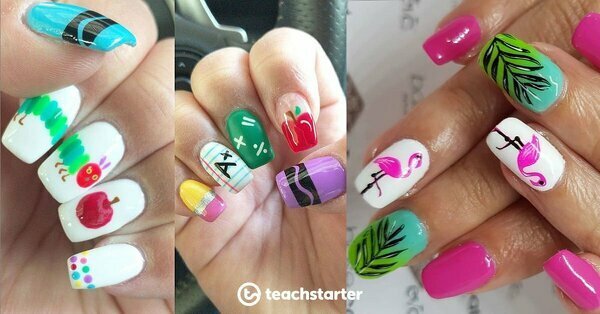 We are just so happy to be able to help and make teachers’ lives a little bit easier! I am really impressed with the quality of the Guided Reading Folder. I add in First Steps developmental checklists and ACARA Literacy trackers. I do have a request-can a folder along similiar lines of 6 plus traits or Seven steps to writing and with similiar tracking details to Guided Reading Folder be made? I’m so glad that you find the Guided Reading folder helpful. I like the idea of including the Literacy trackers in the folder too! Please feel free to make a request for a resource here – https://www.teachstarter.com/request-a-resource/. This is beautifully set up. Thank you its great. is there a link that allows you to download this in one hit? Absolutely, copy this link – http://teachstart.co/2FCF5jg.